Nautilus Models is pleased to announce a series of generic deck planks for the more advanced builder. Tired of the plastic decks on your battleship? Now with our generic planking sets you can update your ship with real wood decks. The sheets come in five standard sizes for various uses. The decks come with a plank spacing of 0.028" for convenience and the etched area is slightly smaller to provide an edge for laser etching. If using a deck to replace a plastic deck, we STRONGLY recommend you use some sort of internal bracing to reduce the chances of sag over a long period of time. Wood will change shape! For a nominal fee, custom deck plank spacing can be arranged. Contact us for details. This deck is designed to be thin enough to lay over your plastic deck for small sections of planked decking. Just cut the wood to the size and shape you need. 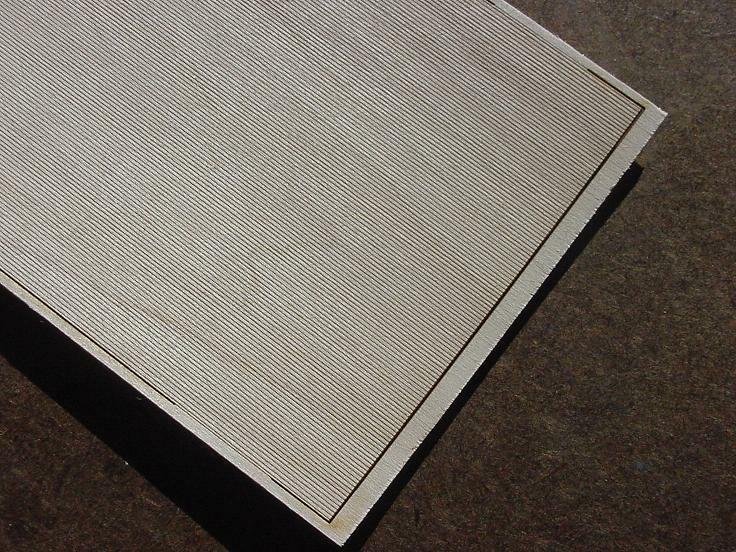 The deck can be used for overlays in larger scales (1/192 and larger) or as a replacement for the plastic decks for smaller areas. The 3/32" basswood makes this deck better suited to replace the plastic decks on most 1/350 scale ships due to the added topweight it can support. Internal bracing is recommended. The width will eliminate the need to use two deck parts to get the proper beam in most ships. The 1/8" basswood makes this deck best suited to replace the plastic decks on most 1/350 scale and larger ships due to the added topweight it can support. Internal bracing is recommended. The width will eliminate the need to use two deck parts to get the proper beam in most ships. The 1/8" basswood makes this deck best suited to replace the plastic decks on most 1/350 scale and larger ships due to the added topweight it can support. Internal bracing is recommended. The width will eliminate the need to use two deck parts to get the proper beam in most ships and 8" will serve for even the beamiest of 1/350 ships!